**The full inside story of the breathtaking rise and shocking collapse of Theranos, the one-time multibillion-dollar biotech startup founded by Elizabeth Holmes—now the subject of the HBO documentary *The Inventor—*by the prize-winning journalist who first broke the story and pursued it to the end. I don't finish a lot of books, but this one is a real page-turner - kind of a thriller where the stakes for some people were potentially their careers or life savings. The author was the journalist who broke the story about Theranos' massive fraud. 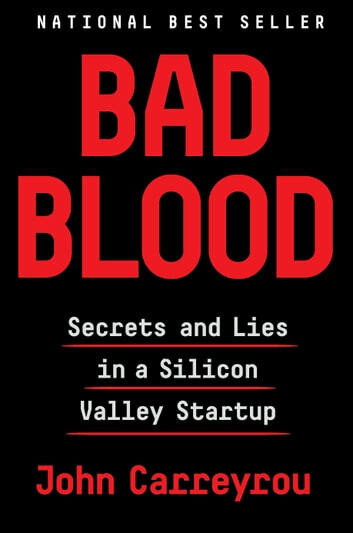 Foremost, this book gives you an idea of what it must have been like to work for Theranos from first-hand accounts of former employees. They found themselves working for a company which lied to its investors and business partners and which put patients at risk. As the ones who were most familiar with the violations and lies that the company was engaged in, Theranos ruthlessly harassed employees when they could no longer stomach what was going on and left the company. As a result, the way in which the truth finally got out turned out to be one of the more interesting aspects of this story. The collection of high flying executives, politicians, wealthy elites, and even a four star general who were made to look like fools is incredible. The degree to which critics were sidelined by Theranos, its board, and at least one of its business partners is shocking. The stories of individuals who stepped forward at great personal risk to themselves is scary and inspiring. The main content is contained within the first 80% of the book. The remainder is composed of extensive end notes. Highly recommended. Having read the book, I am looking forward to the movie when it comes out. The book is an easy read that was hard to put down until I was finished. What a great piece of journalism. Meticulously fact checked with credible sources makes this so enjoyable to read in that you know this is all true. 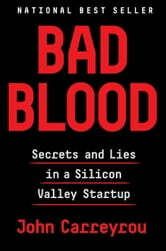 This is the true story of Theranos a multimillion dollar start up which promised to revolutionize the blood testing industry. Elisabeth Holmes promised the moon but so much went the other way. This book is a real page turner with drama intrigue betrayal throughout the entitre true story .I couldnt put it down. Really loved it, fascinating read. Even though english is not my first language, it was easy to digest and if not for the day to day obligations I think I would have gone through it in one sitting, it was that good. I see it as a warning that nobody is immune to a good sales pitch from a really charismatic person. Tears down a long standing curtain of lies. Informative and entertaining.